This is Black Jack the way you always wanted it to be - on your Pocket and Desktop PC! 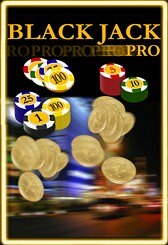 Fully animated and with an array of cool features, Black Jack Pro entertains, teaches and makes you a better player who can beat the house! Click here to learn all about the game that will help you become a true Black Jack Pro! NOW AVAILABLE AS AN IMPROVED FULLSCREEN WINDOWS APPLICATION FOR ONLY 19.99! Registration keys for Pocket PCs work across all Pocket PC platforms!